I have some really exciting news to share! 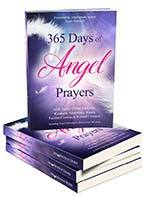 I am one of 160 amazing Angel Messenger authors who have joined together for the first time to collaborate on a wonderful new book, 365 Days of Angel Prayers. Since changing careers just three years ago, I have trusted the angels to guide me in the work I do through life coaching, energy work, my Souly Sister Facebook page, volunteering and everyday conversations with people just like you, who I am meant to teach and learn from. I am so incredibly proud of Karen Cowperthwaite that she not only has completely transformed herself, but also has become an extraordinary Intuitive Coach within The Master Intuitive Coach Institute. Her kindness and strength and unerring patience and compassion with people — I know she will change lives. Whoever hires Karen will truly be fortunate indeed!